Find the free printable version here. I saw this quote floating around on pinterest awhile ago and it immediately struck a chord with me. I know I am incredibly blessed, and I always try to be grateful for the things that I have. However, I also frequently find myself wanting/needing/wishing for things that I don’t have. While I do think wanting things and being grateful can exist harmoniously inside me, I think it is an interesting balance. The key ingredient, in my humble opinion, is labeling your wants for what they really are- wants not needs. Maybe I don’t need a bigger closet, just less clothes. Maybe we don’t need to go out to eat so often, we just need to be better at planning ahead. Maybe we don’t need more money, we just need less payments. I am a clothing hoarder. At least, I was, before this last weekend. 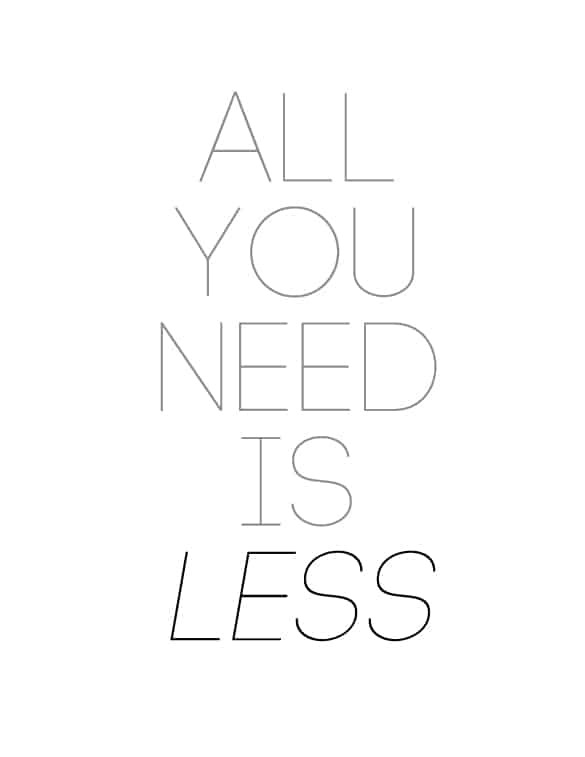 I knew that my closet was the perfect place to put this “less is more” principle to the test because, that is where I have the most. I had recently read this post on how to clean out your closet for good from Stripes and Polka Dots blog and I used it as my guideline which helped tremendously. At first, adding things to the giveaway pile was hard, I would look at each thing and debate with myself.. even if I hadn’t worn said item in over a year. The more I got rollin’ though, the easier it became. I ditched things that were currently in trend, things that were expensive, things that were sentimental, and things that still had the tags on. Because, clothing is meant to be worn. If I know I won’t wear it (for whatever the reason) then what is the purpose of keeping it around? *In the spirit of complete honesty, I also threw out 7 (count em’) high school sweatshirts…haha, yikes! ^^^You guys, this is only part of the giveaway pile… I know, right??! 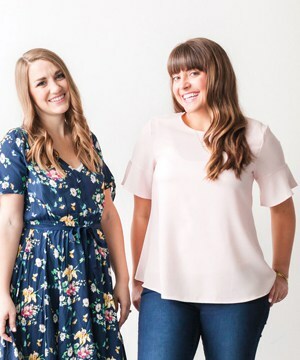 Before, I had a closet packed full of clothes, and I still frequently thought to myself “I have nothing to wear.” I got rid of over FOUR BLACK TRASH BAGS worth of clothes, and you guys, I feel like I have lost 20 lbs. Over the last few days I have found myself wandering unconsciously into my closet and just smiling dumbly at my neat, organized wardrobe. Getting dressed is quick, easy, and fun, because I like everything in my closet and everything fits. Now I can see that those jeans that used to fit me before I had two children were not motivating me to get skinny, they were making me want to grab my sweatpants and a twix and sulk in fat girl land. ^^^Just one wall of my closet. I mean, look how many junky t-shirts I had on that middle shelf on the left? The pictures don’t even do it justice. I feel fresh, motivated, and blessed. It honestly is sick how much excess I had. I am happy knowing that someone else will get use out of items that just didn’t work for me, and as a bonus I sold a couple of the more expensive items and made enough money to buy myself completely new bathroom linens to replace our old gross ones! I am excited to clean out the rest of my house to make sure all the things we pack around with us actually add value to our lives. Thanks for reading, you guys really are the best. If you liked this post, you may also like Budgeting: It’s Personal and Why I Keep My Heinous Couches. This post may be linked up. Love this! Posting on my desk top:) Pinned too! I love that quote… I can totally relate to walking into a full closet but feeling like there’s nothing to wear. I thought I was good at purging but this has given me new motivation to really be strict with myself. I’m so glad I am not the only one! I am going to choose wardrobe pieces really carefully from now on as well! Thanks so much for commenting, made my day! 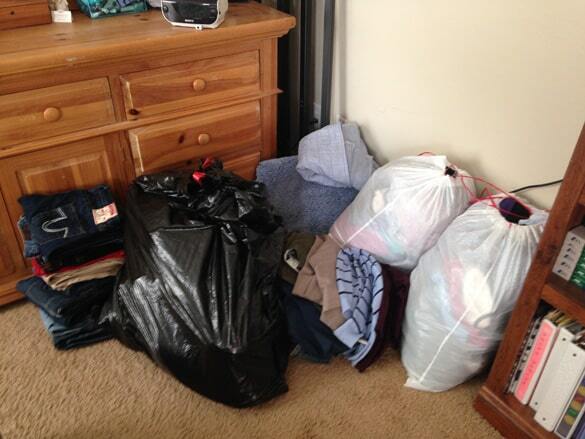 I have had cleaning out my closet on my to-do list for weeks but blog stuff is trumping it! :( SOON. FOR REAL. Girl you need to! It feels so good! Nothing like a good purge and clean to rejuvenate! 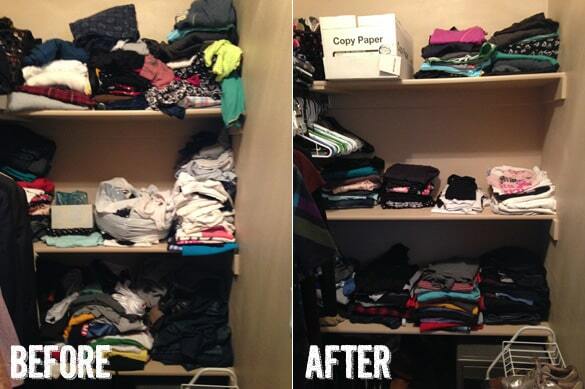 I am addicted to spring cleaning but the best part of getting rid of clothes is…fashion swaps with friends! What a fun idea!! I will totally have to try that next time! Thanks for sharing!! Awesome job lady!! I’m impressed to see that many bags! Haha thanks! I’m more embarrased than proud, but hey, at least I finally did it! Haha! I’m so glad you like it! I am totally OCD too!